Explanation: That's not lightning, and it did not strike between those mountains. 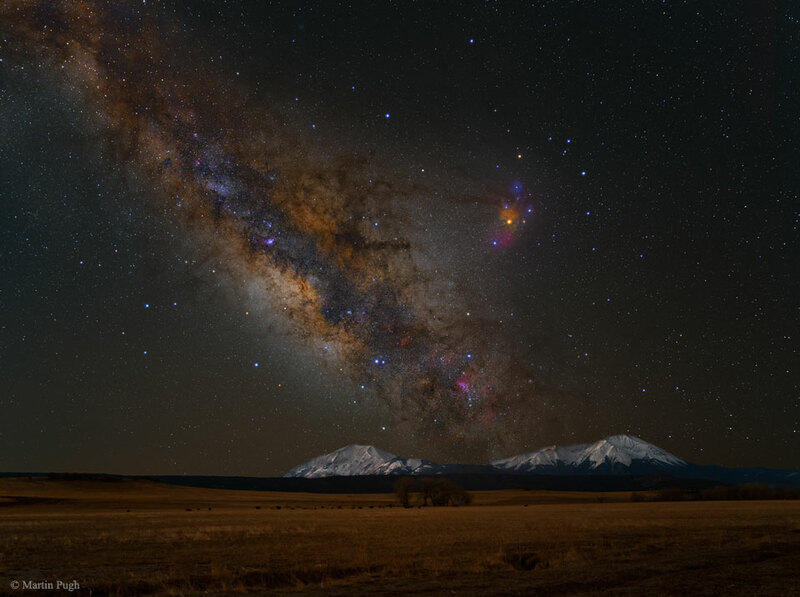 The diagonal band is actually the central band of our Milky Way Galaxy, while the twin peaks are actually called the Spanish Peaks -- but located in Colorado, USA. Although each Spanish peak is composed of a slightly different type of rock, both are approximately 25 million years old. This serene yet spirited image composite was meticulously created by merging a series of images all taken from the same location on one night and early last month. In the first series of exposures, the background sky was built up, with great detail being revealed in the Milky Way dust lanes as well as the large colourful region surrounding the star Rho Ophiuchus just right of centre. One sky image, though, was taken using a fogging filter so that brighter stars would appear more spread out and so more prominent. As a bonus, the planets Mars and Saturn are placed right above peaks and make an orange triangle with the bright star Antares. Later that night, after the moonrise, the Moon itself naturally illuminated the snow covered mountain tops.